Unique double jacket construction, combining the supple high strength of Nylon 6.6 yarn and polyester filament fibers to form a highly abrasion resistant outer jacket and an inner jacket with increased tensile strength and durability. Our proprietary reverse twill weave construction reduces friction loss while ensuring the hose is lightweight, easy to handle and easy to pack. Customize the core of this double jacket attack line with your choice of a thin wall, high tensile, EPDM rubber liner (Magnum) or polyurethane liner (Maglite). 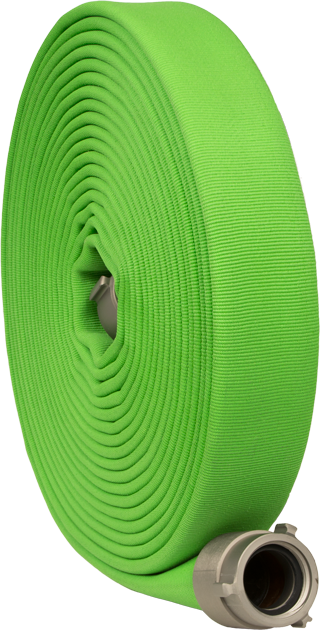 Both of these dependable liner options provide superior kink resistance and eliminate ozone deterioration while maintaining the lightweight integrity of the hose. Maglite’s polyurethane liner material meets NSF (National Sanitation Foundation) Standard 61 for potable water. The outer jacket is mildew resistant and is also available with iconic “Key-Lok” polyurethane based polymer impregnation for additional abrasion and moisture resistance. Double jacket construction is tightly woven from entangled filament Nylon 6.6 yarn in both the inside and outside jackets for increased abrasion resistance. The filler yarns of both the inner and outer jackets are high tenacity filament polyester for increased tensile strength and durability. Double jackets encapsulate a rubber lining consisting of single-ply extruded tube of synthetic high tensile EPDM compounded (Magnum) or synthetic polyurethane (Maglite) that is ozone resistant. Magnum and Maglite are treated with a special “Key-Lok” polyurethane based polymer impregnation for enhanced color and added abrasion resistance. Magnum and Maglite can be coupled with 6061-T6 extruded aluminum threaded couplings or forged Storz. Special threads or other custom features available upon request. Barcode recess available at additional charge. The minimum burst test pressure when tested in accordance to NFPA 1961 on all Magnum diameters up to 3" shall be 1200 psi / 82 bar. Minimum burst test requirements for 4" and 5" diameters shall be 900 psi / 62 bar. Service test pressures stenciled on the hose shall be in accordance with current minimum requirements of NFPA 1962. 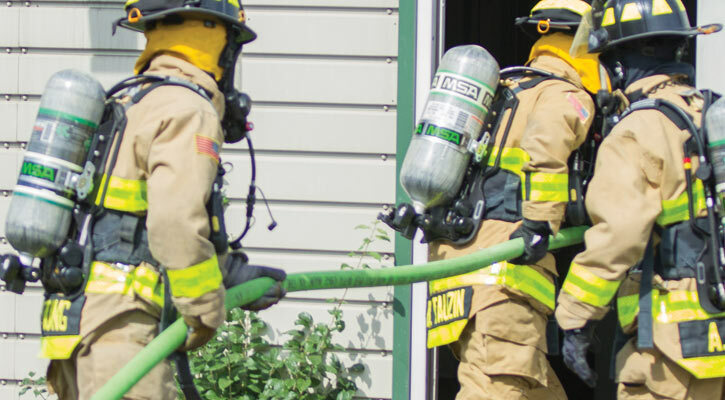 Magnum and Maglite hose meet and exceed all performance requirements of NFPA 1961 and MIL‑H‑24606 latest edition standards. Magnum hose with an EPDM liner has a potential service life and warranty of 10 years with a lifetime warranty against liner delamination, barring mistreatment that would render it unfit for service. Upon delivery, the hose shall be free from defects in materials and workmanship. Maglite hose with a polyurethane liner has a 5-year warranty against liner delamination, barring mistreatment that would render it unfit for service. Upon delivery, the hose shall be free from defects in materials and workmanship.